Let me start off by asking, who doesn't like pizza?! No one?! Okay, good! That's what I thought! Moving right along. Today's Dorm Room Workout Series post is all about enjoying your pizza and not having to worry about it later! Now, I'm not saying let's go eat all the pizza for every meal, in moderation, everything in moderation. So , this workout is perfect for the post pizza feast! In our neck of the woods if you don't like Imo's then you're just looked at like a crazy person and until a few years ago, I was one of those crazy people. What can I say, living here my whole life I finally came around and now am obsessed and understand the love! If you're ever in the area go on and try our local pizza joint, there's plenty of locations all around the St. Louis area and you won't regret it! We did, however just have a Mellow Mushroom open up close by and the second I saw it being built, I told Andrew we would have to go try it out! So on our first date night alone (no kids, no friends) in a very very long time, we went to Mellow Mushroom and I just instantly fell in love. From the aesthetics to the incredible pizza and extensive beer menu, I was just in pizza heaven! Again, if you don't have one in your area and are ever around these parts, go and check them out as well!!! ... As if my word wasn't enough, just take a look at that Mellow Mushroom goodness!!! 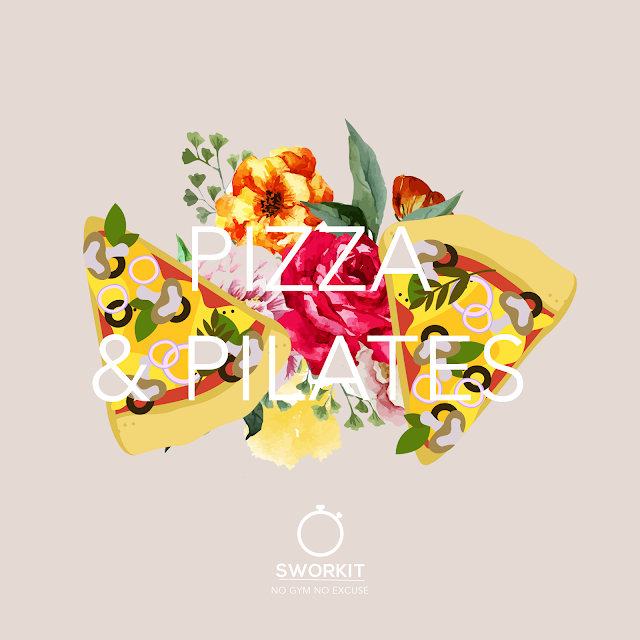 ANYWAY, now that you're starving and probably craving pizza go on and check out this weeks workout brought to you by myself and Sworkit!! !